Definition at line 32 of file msiquery.h. Definition at line 284 of file msiquery.h. Definition at line 215 of file msiquery.h. Definition at line 300 of file msiquery.h. Definition at line 218 of file msiquery.h. Definition at line 205 of file msiquery.h. Definition at line 304 of file msiquery.h. Definition at line 312 of file msiquery.h. Definition at line 174 of file msiquery.h. Definition at line 69 of file msiquery.h. Definition at line 70 of file msiquery.h. Definition at line 68 of file msiquery.h. Definition at line 79 of file msiquery.h. Definition at line 66 of file msiquery.h. Definition at line 67 of file msiquery.h. Definition at line 210 of file msiquery.h. Definition at line 238 of file msiquery.h. Definition at line 197 of file msiquery.h. Definition at line 234 of file msiquery.h. Definition at line 329 of file msiquery.h. Definition at line 225 of file msiquery.h. Definition at line 228 of file msiquery.h. Definition at line 243 of file msiquery.h. Definition at line 259 of file msiquery.h. Definition at line 288 of file msiquery.h. Definition at line 251 of file msiquery.h. Definition at line 308 of file msiquery.h. Definition at line 280 of file msiquery.h. Definition at line 276 of file msiquery.h. Definition at line 190 of file msiquery.h. Definition at line 200 of file msiquery.h. Definition at line 187 of file msiquery.h. Definition at line 316 of file msiquery.h. Definition at line 231 of file msiquery.h. Definition at line 268 of file msiquery.h. Definition at line 272 of file msiquery.h. Definition at line 247 of file msiquery.h. Definition at line 255 of file msiquery.h. Definition at line 292 of file msiquery.h. Definition at line 296 of file msiquery.h. Definition at line 177 of file msiquery.h. Definition at line 34 of file msiquery.h. Definition at line 24 of file msiquery.h. Definition at line 40 of file msiquery.h. Definition at line 104 of file msiquery.h. Definition at line 141 of file msiquery.h. Definition at line 48 of file msiquery.h. Definition at line 81 of file msiquery.h. Definition at line 148 of file msiquery.h. Definition at line 1169 of file suminfo.c. Definition at line 1184 of file suminfo.c. Definition at line 778 of file msiquery.c. Definition at line 752 of file msiquery.c. Definition at line 813 of file msiquery.c. Referenced by add_custom_dll(), create_database(), create_database_wordcount(), create_db(), create_package_db(), generate_transform(), helper_createpackage(), set_admin_summary_info(), test_access(), test_binary(), test_createtable(), test_defaultdatabase(), test_deleterow(), test_emptypackage(), test_forcecodepage(), test_icon_table(), test_int_widths(), test_integers(), test_longstrings(), test_msibadqueries(), test_msidatabase(), test_MsiDatabaseCommit(), test_MsiEnumComponentCosts(), test_MsiGetProductProperty(), test_MsiGetSourcePath(), test_msiinsert(), test_MsiOpenDatabase(), test_shortlongsource(), test_states(), test_storages_table(), test_streamtable(), test_stringtable(), test_suminfo(), test_top_level_action(), test_try_transform(), and test_update(). Definition at line 797 of file msiquery.c. Definition at line 805 of file msiquery.c. Definition at line 983 of file msiquery.c. Definition at line 937 of file msiquery.c. Referenced by mrd_GetPrimaryKeys(), and MsiDatabaseGetPrimaryKeysA(). Definition at line 1003 of file msiquery.c. Referenced by test_alter(), test_emptypackage(), and test_temporary_table(). Definition at line 1023 of file msiquery.c. Referenced by mrd_IsTablePersistent(), and MsiDatabaseIsTablePersistentA(). Definition at line 88 of file msiquery.c. Referenced by do_query(), find_entry(), find_prop_in_property(), get_column_info(), get_columns_table_type(), get_integer(), get_string(), run_query(), test_carriagereturn(), test_collation(), test_columnorder(), test_createtable(), test_dbmerge(), test_deleterow(), test_droptable(), test_emptypackage(), test_fieldzero(), test_getcolinfo(), test_handle_limit(), test_insertorder(), test_integers(), test_join(), test_longstrings(), test_msiexport(), test_msiimport(), test_msiinsert(), test_noquotes(), test_order(), test_packagecoltypes(), test_quotes(), test_rows_order(), test_select_column_names(), test_select_markers(), test_select_with_tablenames(), test_simple_patch(), test_storages_table(), test_streamtable(), test_stringtable(), test_suminfo_import(), test_system_tables(), test_tables_order(), test_temporary_table(), test_try_transform(), test_update(), test_viewmodify(), test_viewmodify_assign(), test_viewmodify_delete(), test_viewmodify_delete_temporary(), test_viewmodify_refresh(), test_viewmodify_update(), test_where(), test_where_not_in_selected(), test_where_viewmodify(), and try_query_param(). Definition at line 241 of file msiquery.c. Referenced by database_invoke(), find_entryW(), mrd_OpenView(), MsiDatabaseOpenViewA(), run_queryW(), and test_collation(). Definition at line 4137 of file dialog.c. Definition at line 1692 of file package.c. Referenced by mrp_GetActiveDatabase(), session_invoke(), test_emptypackage(), test_MsiSetProperty(), test_property_table(), test_simple_patch(), and test_system_tables(). Definition at line 710 of file msiquery.c. Definition at line 2488 of file package.c. 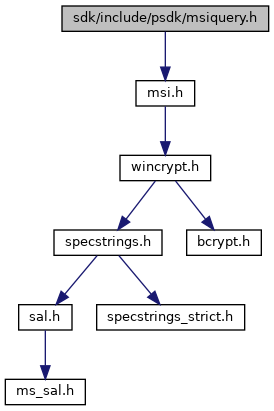 Referenced by check_prop_empty(), da_deferred(), da_immediate(), test_appsearch(), test_appsearch_complocator(), test_appsearch_drlocator(), test_appsearch_inilocator(), test_appsearch_reglocator(), test_ccpsearch(), test_complocator(), test_dbtopackage(), test_formatrecord_tables(), test_getproperty(), test_installprops(), test_MsiDatabaseCommit(), test_MsiGetSourcePath(), test_MsiOpenProduct(), test_MsiSetProperty(), test_property_table(), test_props(), test_retval(), test_settargetpath(), test_simple_patch(), test_sourcedir(), and test_try_transform(). Definition at line 2507 of file package.c. Referenced by mrp_GetProperty(), and session_invoke(). Definition at line 586 of file suminfo.c. Referenced by helper_createpackage(), set_admin_summary_info(), set_suminfo(), set_suminfo_prop(), set_summary_dword(), set_summary_info(), set_summary_str(), set_transform_summary_info(), test_emptypackage(), test_streamtable(), test_suminfo(), test_suminfo_import(), test_summary_binary(), and write_msi_summary_info(). Definition at line 514 of file suminfo.c. Referenced by database_invoke(), get_patch_product_codes(), InstallerImpl_SummaryInformation(), mrd_GetSummaryInformation(), msi_publish_product_properties(), and MsiGetSummaryInformationA(). Definition at line 4241 of file dialog.c. Definition at line 4235 of file dialog.c. Definition at line 4217 of file dialog.c. Definition at line 4201 of file dialog.c. Definition at line 2052 of file package.c. Referenced by mrp_ProcessMessage(), ok_(), session_invoke(), test_externalui(), and test_externalui_message().